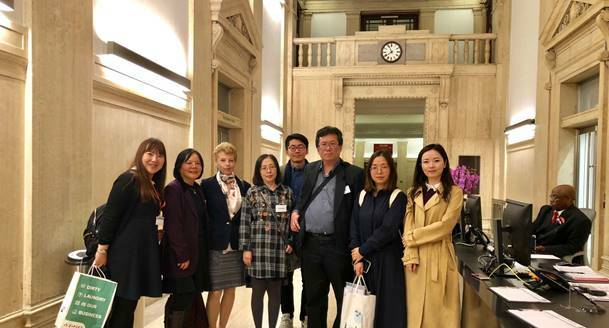 Having arrived in London in the evening of 11th September 2018, Professor Wang Ping, Vice-President of Chengdu Institute of Public Administration, made a three-day academic exchange, which included attendance at a conference and brief visits to London’s governmental and cultural sites from 11th to 14th September 2018, at the invitation of Global China Institute. 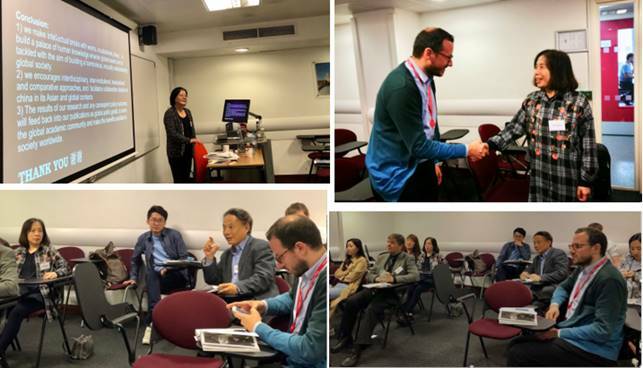 On 12th September, President Wang attended the BACS (British Association for Chinese Studies) Annual Conference, held in King’s College London (KCL). 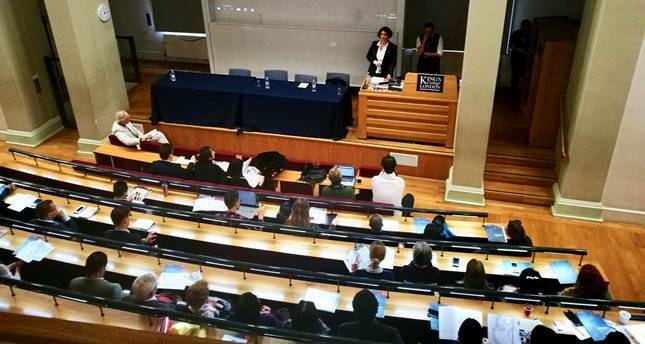 Dr Charlotte Goodburn, Deputy Director of the Lau China Institute at King’s College, delivered the opening remarks, outlining the history of Chinese Studies at KCL. Also, on behalf of Prof. Kerry Brown, Director of the Lau China Institute, Dr Goodburn gave a warm welcome to the scholars, experts and students from home and abroad. 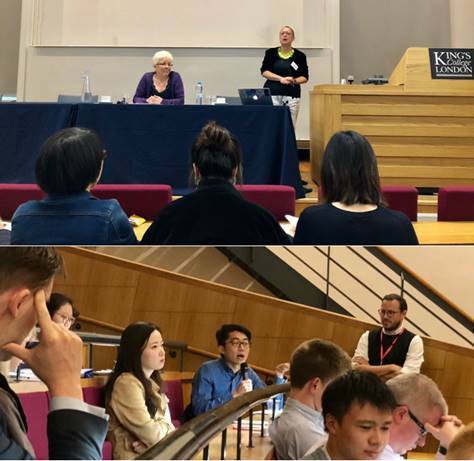 Top left: Prof. Naomi Standen (on the right), President of BACS and professor in department of history at the University of Birmingham, chaired the first keynote speech, which was given by Carrie Gracie (on the left), the BBC’s former China Editor. Ms. Gracie shared her experiences around the issue of “how to tell Chinese stories” in domestic and foreign journalism. In her view, China has a lot of journalists, but little proper journalism. The understanding of different kinds of journalism should be an important topic relating to China in comparative perspective. Bottom left: Zhang Yuyuan, intern researcher at Global China Institute and Master’s student at University College London, asked a question about the contrasting practices of Western and Chinese journalism. The opening session was followed by panel discussions. The panel attended by President Wang was entitled “Transcultural cooperation in Chengdu – Tianfu culture and civilization”. Prof. Xiangqun Chang, Director of Global China Institute, chaired the panel. The topic of President Wang’s presentation was “Transcultural Cooperation and Practice in the Tianfu Culture of Chengdu against the Background of the Belt and Road Initiative”. 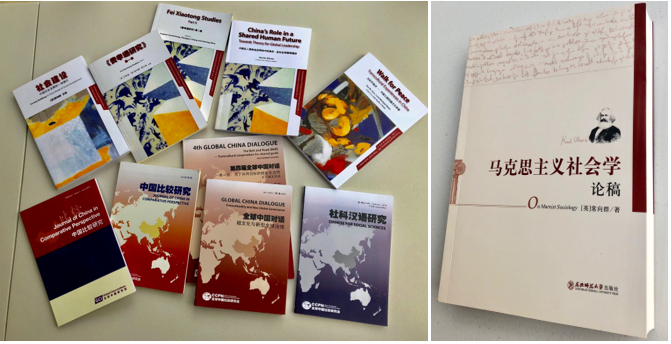 She analysed the features of innovation, inclusiveness and openness of “Tianfu culture” and examined four transcultural cases: the “Southern Silk Road”, the “Maha Pool”, the “Rong–Europe Railway” and China’s giant pandas. She drew four inspirations from “Tianfu culture”: it promotes transcultural practices on the Southern Silk Road; we can go further into the future if we can recall deeper into the past; we may implement the idea of “going out” present in Chengdu’s Tianfu culture; and we are in a position to reinforce the international comparative perspective and cooperative studies on Silk Road cultures and Tianfu culture. A second presentation consisted of a paper written by President Wang and Dr Zhao Shu, Associate Professor of the Chengdu Institute of Public Administration, and entitled “Chengdu's historical and cultural heritage and interpretation of civilization”. It consisted of two parts: “Integration of inclusiveness and immigration culture” (immigration culture, Hakka culture, Sichuan cuisine culture and inclusivity) and “Openness and cultural exchange and extension” (Silk Road culture, Shu Jin [Sichuan figured satin] culture, poetry, music and Sichuan opera). Ingrid Cranfield, Deputy Director of Global China Institute, was involved in editing the translations and delivering both papers in English. Panel participants found the presentations very interesting, providing them with a comprehensive and systematic overview of “Tianfu culture”. The images shown by Prof. Wang vividly showed the relationship between “Tianfu culture” and “transculture”. 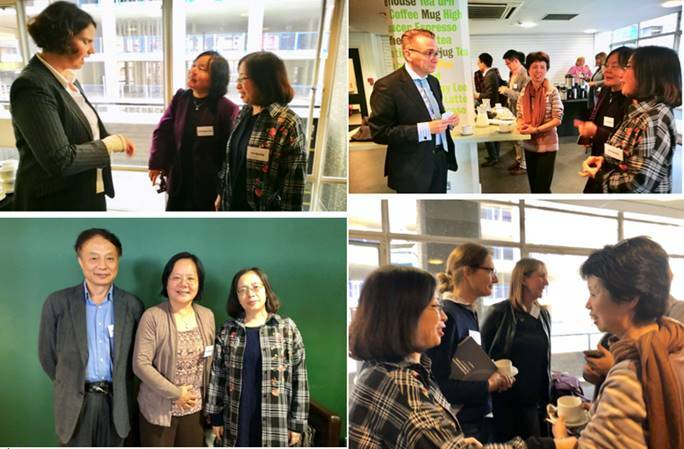 Top left: Ms Cranfield, Prof. Wang and Prof. Chang. Top right: Prof. Wang presented “Tianfu culture” bookmarks as gifts to the two Directors of Global China Institute. Below: The panel participants: Zhang Yuyuan, intern researcher at Global China Institute; Pang Danni, graduate student in Zhejiang University of Media and Communications; Prof. Jin Wei, visiting scholar at Lau China Institute at King’s College London, and Wuhan University; Prof. Chang Xiangqun; Ingrid Cranfield; Prof. Wang Ping, Dr Ivan Hon, translator at Global China Institute; Chen Cheng, volunteer researcher at Global China Institute, graduate student of the University of Westminster. Thanks to Dr Hon and Ms Chen for their translations of the papers. Professor Wang also attended the reception in the early evening. During the reception, Dr Sarah Dauncey, editor of JBACS (Journal of the British Association for Chinese Studies), Associate Professor of the School of Sociology and Social Policy of Nottingham University, awarded the Early Career Researcher Prize to Ros Holmes (University of Oxford), for her essay “Bad Citizens and Symbolic Subjects: Wang Jin, Zhou Tiehai and the Art of (In)Civility”. They shared ideas about this excellent research. 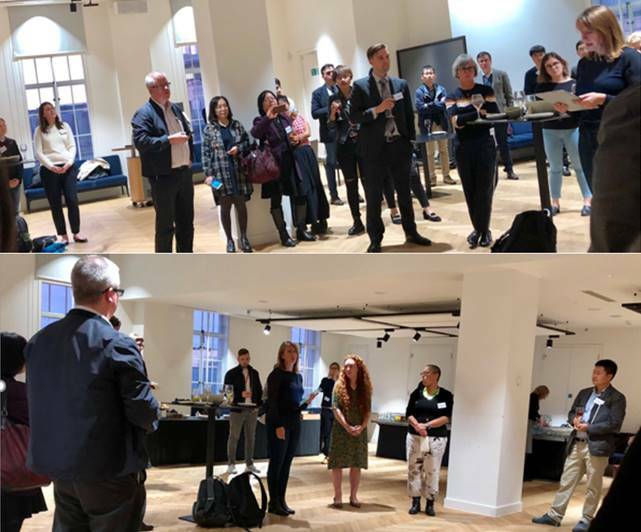 The reception was held in KCL premises in Bush House, the former headquarters of the BBC World Service. The photo below is of colleagues of Global China Institute and Prof. Wang after the reception. 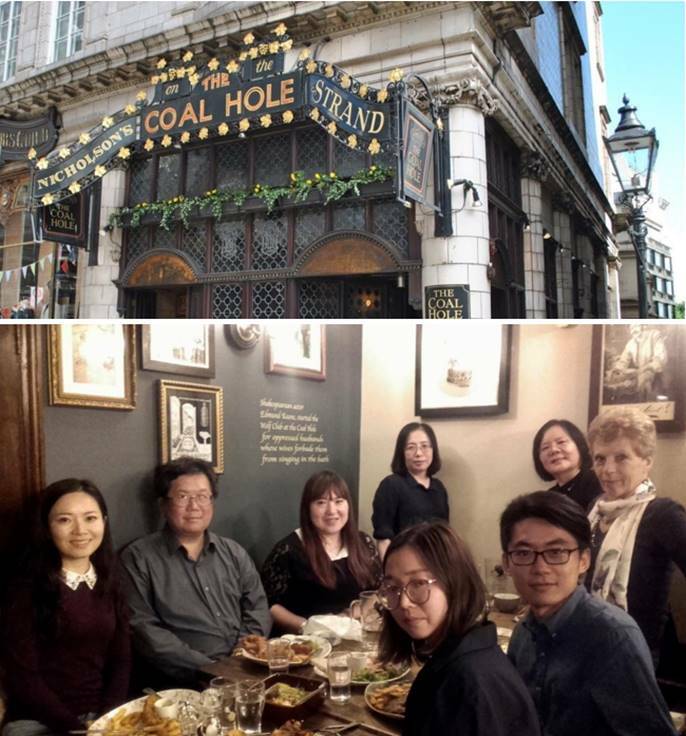 The group then dined at the Coal Hole pub on The Strand, where they continued academic discussions and experienced traditional British pub food and surroundings. There are many theatres situated near KCL. People usually have dinner nearby before the show. Ms Cranfield pointed out some paintings and posters on the wall, which illustrated the fact that in the early 19th centuries centries women forbade Shakespearean actors from singing in the bath and that therefore the men founded a club in this pub, where they could escape the critical eyes and ears of their wives. 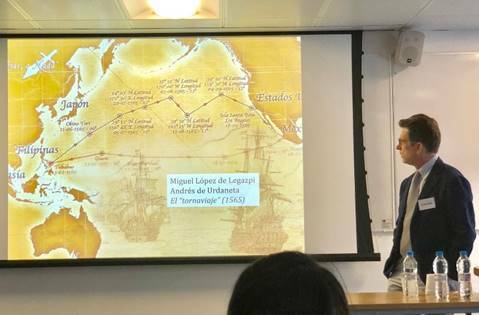 On 13th September, the second keynote speech at the BACS conference was chaired by Dr Konstantinos Tsimonis, lecturer at Lau China Institute. 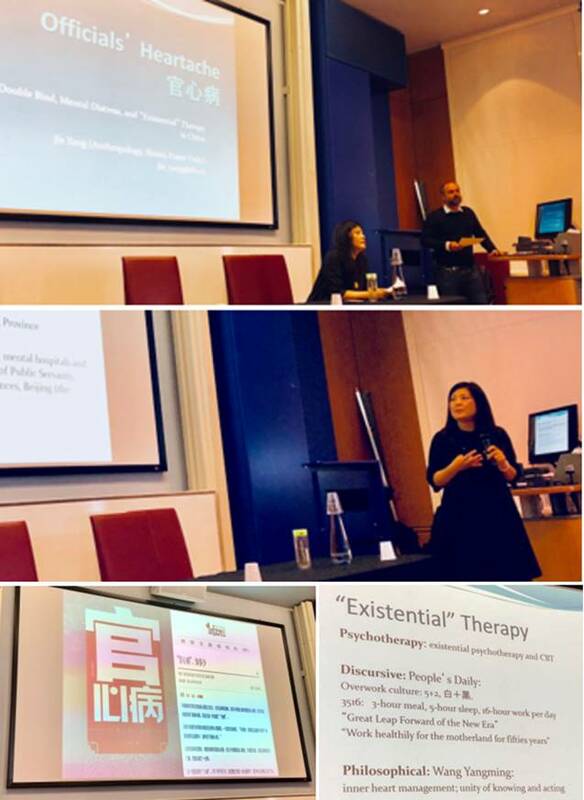 Dr Jie Yang, Associate Professor of Anthropology at Simon Fraser University, spoke about her research on “Officials’ Heartache”, from the interdisciplinary perspectives of anthropology, sociology, cultural research and psychology. It sparked a lively discussion. This was followed by panel discussions. The topic of the panel, shown on the right, was “Dawn of the modern: cultural exchanges between China and the West”. It was chaired by Dr Charlotte Goodburn, and the speakers were Nicholas McGee, Yun Huang and Thomas Jansen (from left to right). The presentations were (in order): “‘On the Spiritual Benefits of Christianity’: Timothy Richard’s (1845-1919) Theology and China’s Modernisation” by Prof. Thomas Jansen from the University of Wales Trinity Saint David; “‘With a millstone about her neck’: China’s Participation in the 1924-1925 Geneva Opium Conferences and its Impacts” by PhD candidate Yun Huang from the University of Strathclyde; and “Conflict and Cross-pollination between Regimes of Subjecthood: The Question of the ‘Anglo-Chinese’ in Qing China” by PhD candidate Nicholas McGee from the University of Toronto. Peter Gordon, editor of Asian Review of Books and co-author of The Silver Way: China, Spanish America and the Birth of Globalization, 1565–1815. In his presentation, he traced the history of the Silver Way, and compared it to the Silk Road, drawing lessons from economic change and expounding on the Chinese Belt and Road Initiative. This helped the audience to understand the roles of Latin America and China in the present world. Emeritus Professor Ivan Kennedy spoke about “The Peking Man: What it Means to Be Human”. He introduced the mystery of the Peking Man, found in Zhoukoudian, Beijing, including its place in the history of human evolution and recent evidence based on genomics, and posed several questions. For instance, do all the special human genes come from Africa? 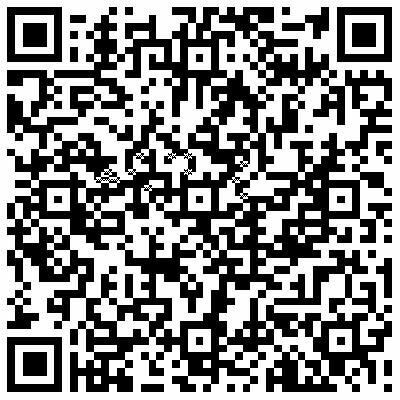 What is the influence of political economy and new technology on intellectual evolution? How important is human choice to the successes and failures of human evolution? Teilhard’s vision of an interdisciplinary global biosphere is on the way to being realized by the internet. Also, what is the role of intelligence and moral choice in ensuring a better human future, and how can that goal be achieved? He hoped that some significant research could be done by 2029, the centennial of the discovery of Peking Man. During the conference breaks, President Wang engaged with other scholars. 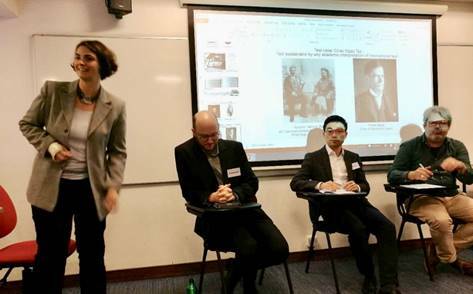 Top left: With Dr Charlotte Goodburn; Top right: With Duncan Bartlett, editor of Asian Affairs; Bottom left: With Prof. Guan Xinping. Born in Chengdu, Prof. Guan is now director of the Society Construction and Management Institute and director of the Social Works and Social Policy department at Nankai University. He attended this conference during a short academic visit to the UK. Bottom right: With Prof. Xiaoling Zhang from Nottingham University. Her presentation topic was “China’s Evolving Public Diplomacy: The Case of Digital Diplomacy” in the panel “E-China: from cyber-governance to e-commerce”. 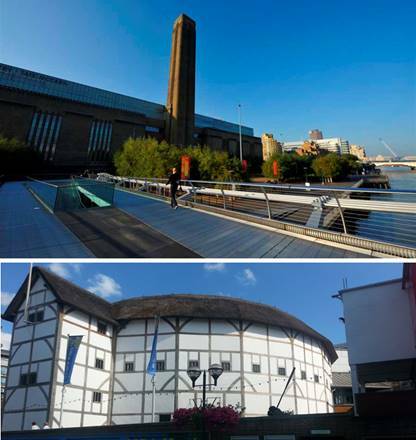 During her visit to London, Prof. Wang also visited cultural and creative attractions in London. 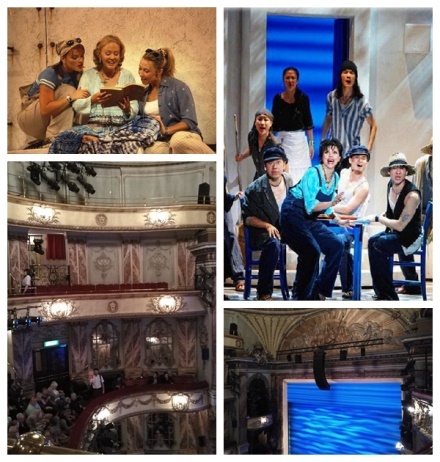 She watched the musical “Mamma Mia!”, which has been performed more than 240 times at the Strand Theatre. She was impresssed that, during the play, the audience were very polite, e.g. they did not talk, or use phones or cameras, and everyone was immersed in the proceedings. The actors performed with great verve and spirit. The play was excellent and very appealing, drawing prolonged applause from the audience at the end. The performers responded to a curtain call several times. It was very touching, moving, impressive, atmospheric and in good taste. 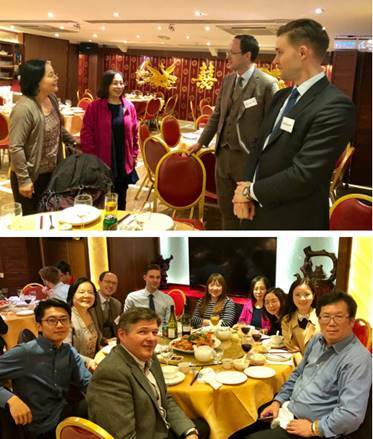 Top: Networking with two British scholars before dinner in Chinatown. They are Dr Andreas Fulda, Associate Professor of Nottingham University, one of the speakers in the workshop on fundraising for China-related research and engagement activities (another speaker was Professor Peter Hays Gries, Director of the Manchester China Institute at the University of Manchester). Standing on the right is Dr Gregory Scott, lecturer at the University of Manchester. Bottom: In the foreground on the left is Prof. Bradley Stock from Principia College, USA. He made a presentation “Compatible to the Core: ‘Root Values’ and Enhanced Harmony in American-Chinese Relations” in the panel “International relations and China: concepts, conflicts, cases”. On 14th September, in the morning, the panel “Learning and teaching: didactic and societal perspectives”, originally included three papers: “Governing Emotions by the Technique of Self-restraint/keji: How Students Cultivate themselves as Confucian Autonomous Learners in Classics Memorization” by PhD student Canglong Wang from the Department of Sociology at the University of Edinburgh. Dr Zhou Hongfen gave a presentation on “Crossing Boundaries: Interculturality in Chinese Language Education”. The topic of Prof. Xiangqun Chang’s presentation was “Globalization of Chinese Social Sciences – Some Highlights with Illustrations”. Participants found the panel interesting and it elicited some discussion. At Canglong Wang’s absent, there were more time for Q & A. This panel was chaired by Dr Igor Rogelja, teaching fellow at Lau China Institute and Coordinator of the Organising Committee of the BACS conference. Top left: Prof. Xiangqun Chang presenting a paper; Top right: Professor Wang and Dr Igor Rogelja; Bottom left: Prof. Guan Xinping asking a question; Bottom right: The participants. 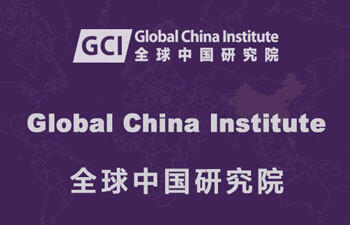 An impressive part of the panel was that Prof. Chang displayed “global public goods”, namely journals, periodicals and book series produced by the Global China Institute (see photo), and further explained that they serve as a “global public good” to contribute to the governance of a global society. The year 2018 is the bicentennial of Karl Marx’s birth. The new edition of On Marxist Sociology, by Prof. Chang, published originally in 1992, has been published recently. After the panel, she briefly introduced the book to Prof. Wang and the other experts and scholars. Top left: Prof. Xiangqun Chang, Vladislav Kruglov, Prof. Bradley Stock, Prof. Wang Ping. 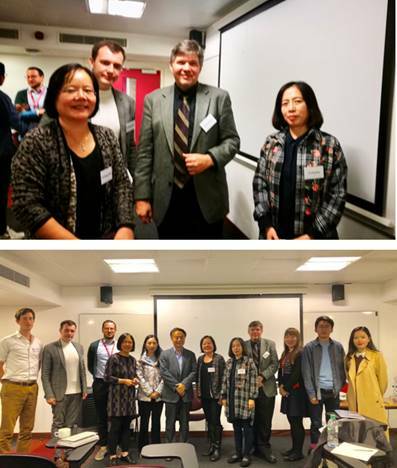 Bottom left: Panel participants, left to right: Simon Vitting, Vladislav Kruglov, Dr Igor Rogelja, Dr Zhou Hongfen, Prof. Guan Xinping and his wife, Prof. Xiangqun Chang, Prof. Wang Ping, Prof. Bradley Stock, Prof. Jin Wei, Zhang Yuyuan, Chen Cheng. 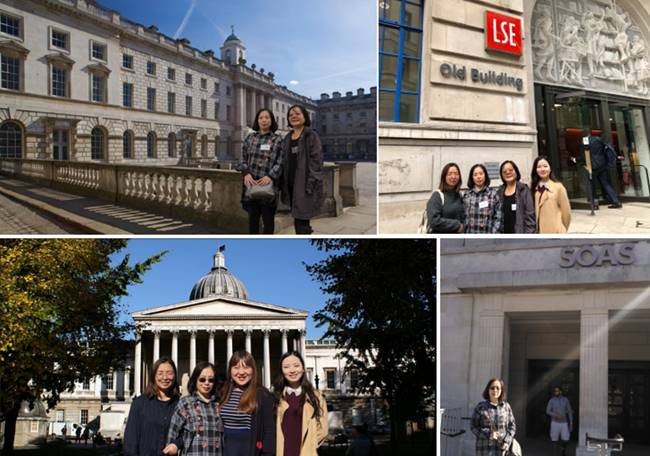 On the afternoon of 14th September, Prof. Wang concluded her visit to London and flew back to Chengdu. 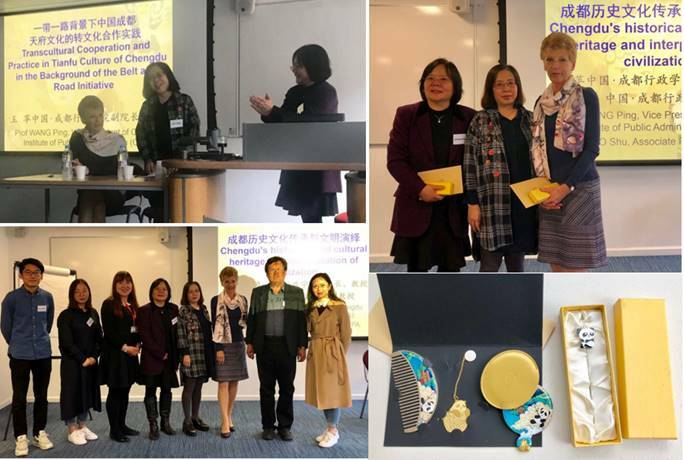 During Prof. Wang’s short visit to UK, although time was very limited, thanks to Prof. Chang’s elaborate planning and the efficient operation of the Global China Institute team, she had a tight and full schedule. She travelled around London, visited and explored famous British universities, research organisations, historical and cultural districts, museums, art galleries, cultural landmarks, parks and public transport. Above left: Prof. Chang explaining the visit schedule to Prof. Wang; Above right: Prof. Chang pointing to the London Underground map and advertisements on an Underground train. During the conference, Prof. Wang visited several nearby universities. Top left: King’s College London; Top right: The London School of Economics and Political Science (left to right: Pang Danni, Wang Ping, Xiangqun Chang, Chen Cheng); Bottom left: University College London (left to right: Pang Danni, Wang Ping, Jin Wei, Chen Cheng); Bottom right: SOAS (School of Oriental and African Studies). 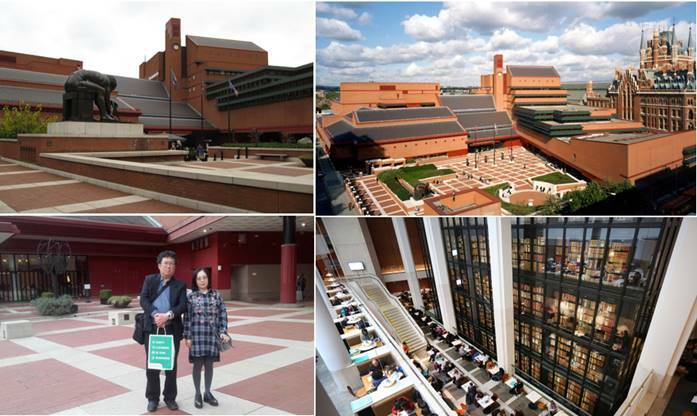 Prof. Wang visited the British Library, accompanied by Dr Ivan Hon. Although the UK has few high-speed rail lines, the transport network covers the whole country. According to Prof. Wang, the distance between Gatwick Airport, to the south of London, and the guesthouse of the Global China Institute, in northwest London, is just over 100 kilometres, but the journey, including only one transfer by train (top left), takes little more than one hour. 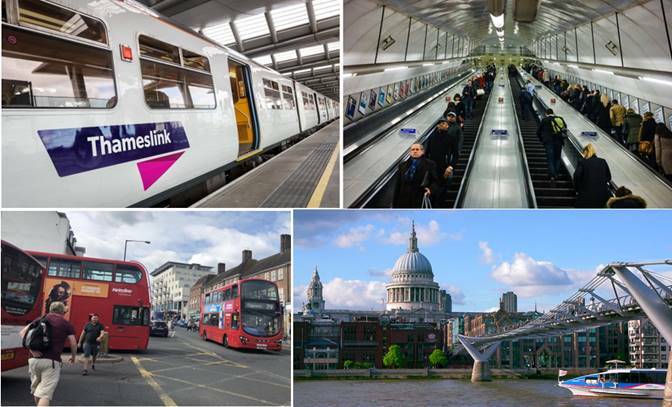 London boasts the world’s first underground railway system, and the London Underground, commonly known as The Tube, handles up to 5 million journeys every day. During the daily rush hours, the trains and platforms are very crowded. People stand on the right when they use the escalator, allowing people who wish to walk to use the lefthand side (top right). Queues are everywhere, but travel is very orderly. People always get on the Tube one by one after letting passengers get off first. In addition to watching their phones, a lot of people read newspapers and books. Bicycles and cars wait to allow pedestrians to cross the road. Prof. Wang was very much impressed by the red buses, which run very frequently and cover a multitude of routes across London. The red double-decker bus seen on London streets is not only a symbol of British public transport, but also a symbol of British culture. The red double-decker was especially designed for London by the British AEC company and the London Transport Bureau. It was first unveiled in 1954 and officially put into use in 1956. London has a long history and its streets are narrow and crowded. At that time, trams, the main public transport, were overcrowded. The double-decker bus, thanks to its light body and revolutionary design, quickly replaced the trams that had been used for many years. It was given a name that suggested its power – “Routemaster” – and was also nicknamed the “road tyrant”. According to statistics, between 1956 and 1968, a total of 2,760 double-decker buses were put into use. Red was chosen as the body colour because much of London looks quite grey, and red is more eye-catching. Red has became the symbol of London, which the designers of the bus would not have expected to happen. Along the river Thames, which runs through London, can be seen some famous attractions from the ferry. The image at bottom right is St Paul’s Cathedral, taken from the ferry. If one walks across the Millennium Bridge from near St Paul’s, one can get to the Tate Modern museum and Shakespeare’s Globe Theatre on the other side of the river. 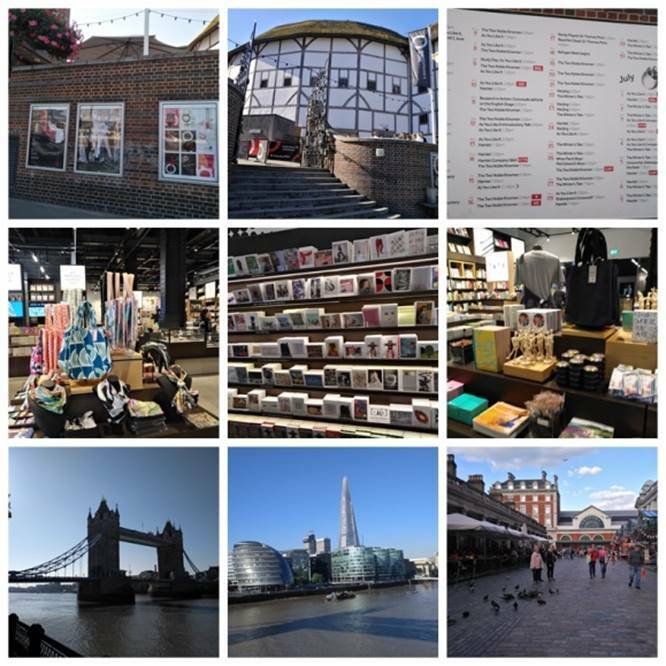 Above are (top) Shakespeare’s Globe Theatre and souvenirs on sale in the theatre shop; (bottom) the famous opening Tower Bridge; post-modern architecture; and Covent Garden. Prof. Wang was particularly interested in parks in London, where space comes at a premium, and yet the government seems quite generous in permitting large lawns to exist and be maintained in the park. Roadside streetlights are sometimes decorated with hanging baskets of flowers. The design of the house at the centre of a park is often exquisite and beautiful, not cluttered but based on the principle that “less is more”. The green area is huge, whether it is in the city centre or the suburbs. Large estates, grasslands, gardens and parks can be seen everywhere. There are a lot of impressive and internationally renowned cultural landmarks in London, including Gothic-style churches, roof gardens, recreation grounds and large lawns. 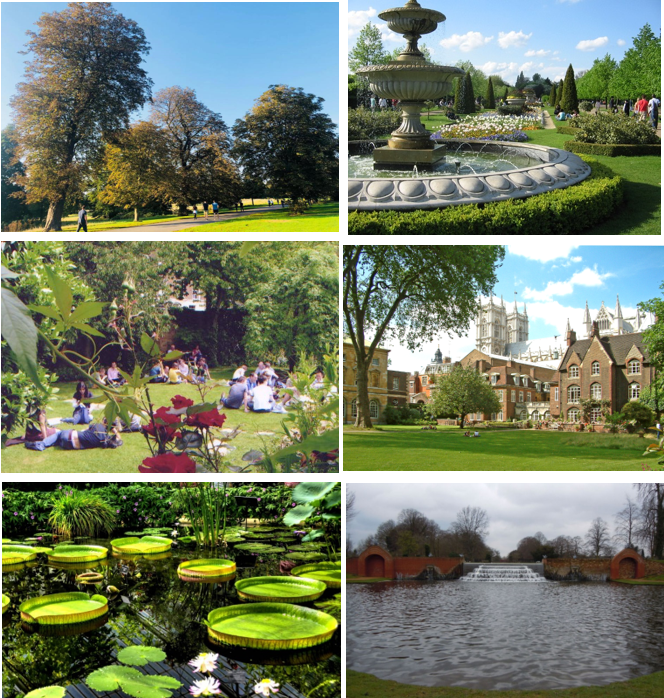 Above are (top to bottom, left to right): Hyde Park, Regents Park, Culpeper Community Garden, Westminster Abbey Garden, and Kew Gardens. 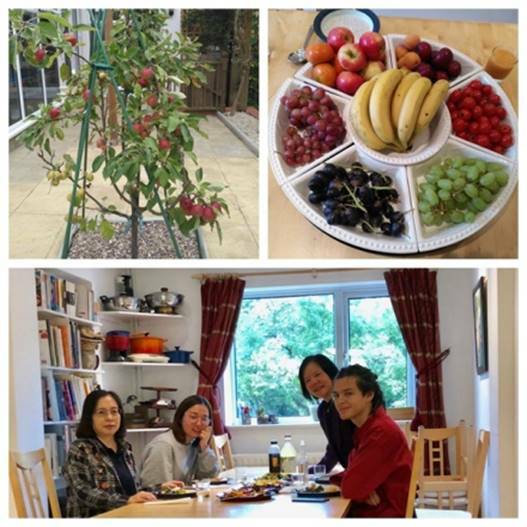 Prof. Wang enjoyed a meal with Prof. Xiangqun Chang, her son Neil Clarke and Danni Pang, allowing her to experience the British family atmosphere and culture. Prof. Wang and Prof. Chang discussed ideas and representative practices in early childhood, primary and secondary education in the UK. For example, all the children participate in different projects when they go to nursery (kindergarten) at the age of three years. When they are four years old, they take part in various performances in Reception (preschool classes), where everyone has the chance to act in a major or supporting role and all throw themselves into their performance, whether they are playing leading or supporting roles. When they are five years old and go to primary school, they take turns at being a class monitor whose job it is to enforce the class rules. All the students must follow the rules, rather than the person. When it is a child’s own turn to be a monitor, it helps him or her to understand how the other students obey the rules. Therefore, the spirits of equality, self-discipline and the ability to participate in management are gradually fostered and become a natural habit.